21st century advances in technology have opened new windows to the world around us that have enabled artists to dive deeper into the heart of matter than ever before. Whether it’s through the use of microscopes to see cells and molecules, or telescopes to see distant planets and galaxies, or in this case, through the use of advanced drilling techniques to reach precious stones, gems, minerals, and core-sample cross sections of Earth, artists are there to explore. And bio artist Sydney Strahan has emerged with fascinating works of art that reflect the nuances and intimate spaces of the layered world that sustains us. Her art is at the same time capable because of this moment of technological advance, yet transcends the millenia of time from whence its inspiration and the art itself was born. Sydney has created amazingly vibrant paintings from core-sample cross sections of microscopically thin layers of Earth. By working with expert Geologists, a variety of interesting rocks and stones offered a visual point of departure for her art work. Sydney Strahan is a graduate of Texas Christian University with a double major in Painting and Printmaking, as well as a life-long explorer of the arts in creativity, movement, and spirituality. Coinciding with a current movement in art known as Bio-Art; art inspired by biological mechanisms, Sydney’s work specifically relates to the exploration of life sciences that examine a human connection to living systems. Additionally, view her beautiful Gemstone Paintings Gallery for more examples of lush art that is reminiscent of worlds within worlds, once hidden deep within the Earth and now available for all too see. 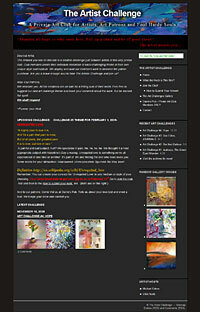 The “Out In the World of Art” section features blog entries that point out areas of interest in the world of Art. Dennis Hwang has been called “the most famous unknown artist in the world” by CNN. He designs the logos on Google.com and millions of people see his art work every day. These galleries of Google logo designs showcase his talent and playful style.